THE DAY has come! We did the implementation of “lesson plan” last night. 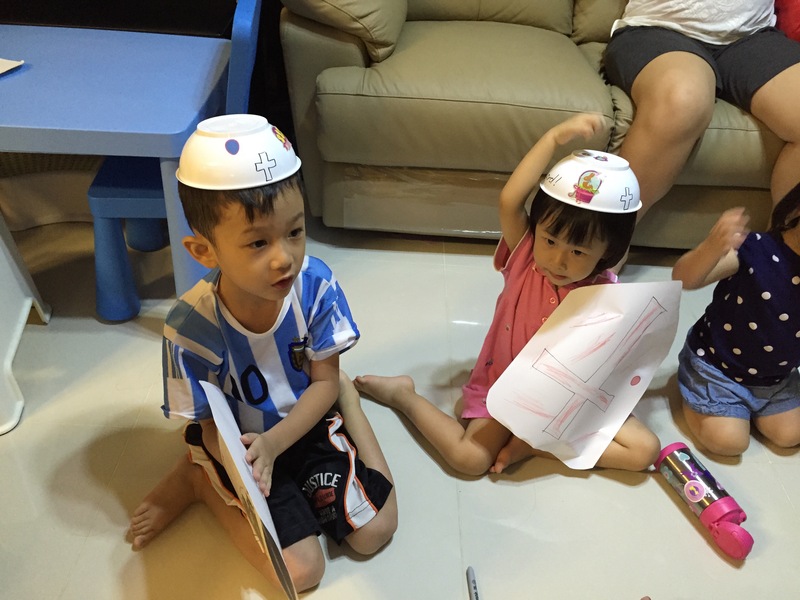 The kids were all excited to start decorating their armour. At the end of the day, Mrs Eio hope the kids can have fun & be able to identify at least one item of the armour. 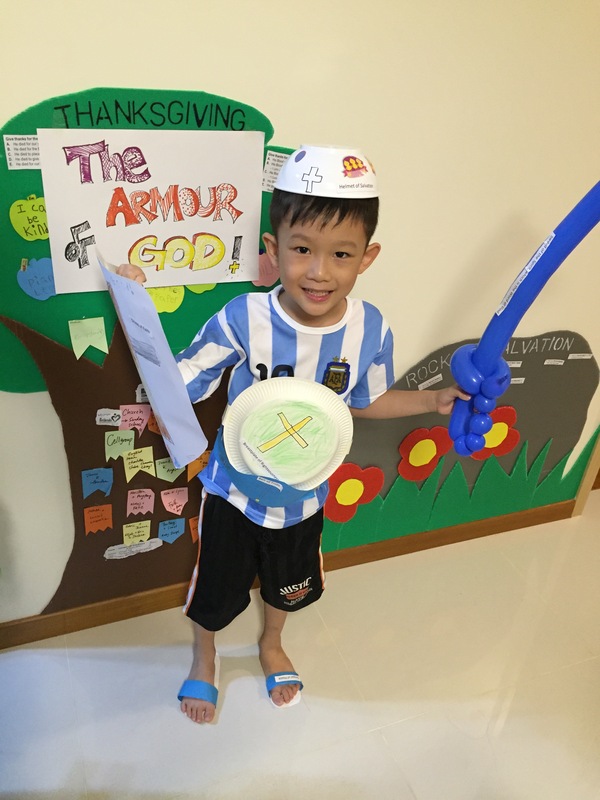 In addition, the kids can decorate their armour, put on the full armour & take a photo. The photo is to help them to recap this topic with their parents back at home. There’s altogether 7 children in our midst last night but Mrs Eio will try to post photos of Eio Kids as it won’t be nice to post the other children’s photo without their parents’ consent. As the children join the activities at different timing, Mrs Eio amended the flow of activities. Some of the children started to work on the helmet, Breast plate & shield while waiting for the rest to join in. After doing 3 pieces of the armour & everyone has arrived, Mr Eio took over to teach the children, the different parts of the armour & the significance of them. After the children worshipped with 2 songs, Mrs Eio did a recap of the items that they had done during the 1st half of the session. Part 2 started with the children decorating & labeling their belt & shoes. By then, the children were so excited that they already started putting on their belts, followed by breastplates. Mrs Eio is so thankful that there’s helpers around to assist the children to put on their armour. Mrs Eio & the other helpers gave out the helmet, Shield & breastplate after the child was ready. 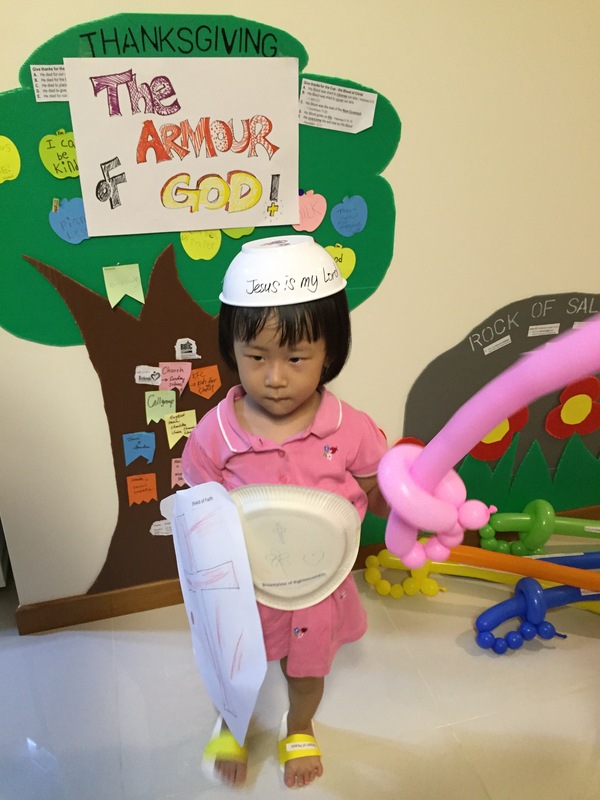 Assessment of learning: The children were only able to receive their sword & take a photo in their full armour after identifying on of the items in the armour verbally. There’s a few challenges while executing the activites last night. 1) the children are of different age group. (2-8 years old) . Hence, only children above 4 years old are able to identify the items in the armour. Nevertheless, the children are very cooperative. 2) some children join in the activities at different timing. 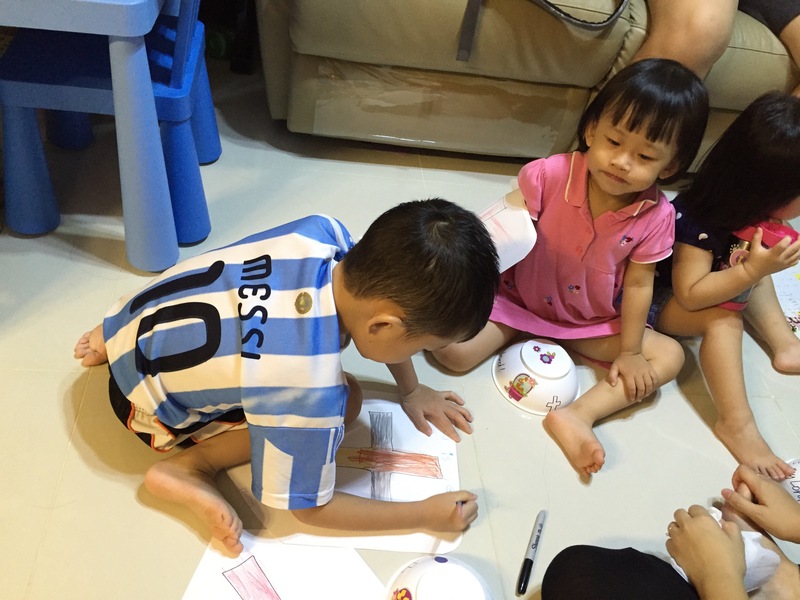 Mrs Eio are thankful to the capable helpers who help them catch up & also lending a hand to the younger children. 1) the armour consisted of 6 items. The items were collected from the children after their have completed their task & redistributed to them at a later stage. 2) the children were extremely excited to receive the sword. Mrs Eio is concerned that they will be distracted or worst still is to start hitting each other after getting it. So the sword was given at the end of the session & given as a reward for identifying one part of the armour (for 4 years old & above). After all the children had taken a photo of themselves in His full armour, Mrs Eio led them to close in Prayer before the children could have their refreshments. Mrs Eio thinks there’s always room for improvement. She’s now toying with another idea but not sure if Mr Eio will approve her proposal. Lol. Previous postPreparations to put on His Armour!